A penetrometer determines the consistency or hardness of a substance by measuring the depth or rate of penetration of a rod or needle driven into it by a known force. 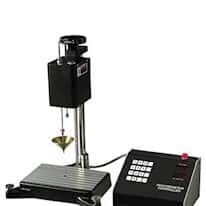 Penetrometers are useful for penetration tests on lubricating greases, petroleum waxes, and bitumens and for performing consistency tests on a wide range of food products, cosmetics, pastes, and other solid to semisolid products. Use soil penetrometers to measure compressive soil strength or soil compaction.